Hotel Ladakh Heaven presents deuxe10 rooms. Hotel Ladakh Heaven offers superb service and all the essential amenities to rejuvenate travelers. Each room of hotel is well-appointed with contemporary amenities like ironing facilities, in room safe, desk, satellite/cable TV, telephone in each room. 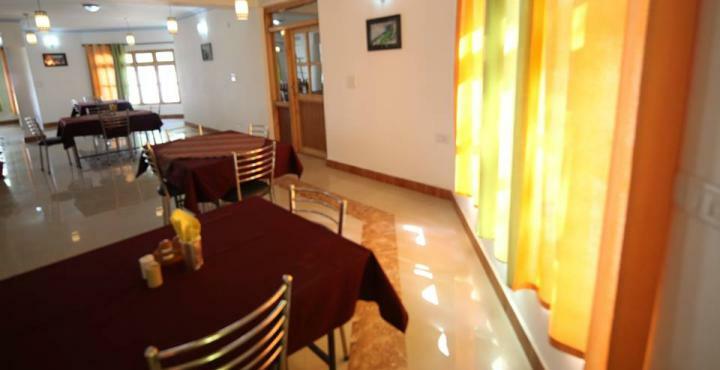 Ladakh Heaven hotel Leh offers wonderful recreational facilities such as garden to make visitors stay really memorable. Doctor on Call, Internet/Wi-Fi, Travel Counter, Laundry Facilities, Taxi Service, Room Service, Airport Transportation, Family/Child Friendly, Gardens, Currency Exchange. Luggage Rack, Safe In Room, Ceiling Fan, Dustbins, Attached Bathroom, Bottled Water in Room, H/C Water, Television Room, Telephone, Bathtub Only. User reviews for "Ladakh Heaven Hotel Leh"